Kite Power or “Airborne Wind Energy” is a young field of science and engineering. We develop fast flying kites to harvest energy from faster winds at higher altitudes. This uses less material to make more power. Networked kite power is the logical next step. The idea of using kites for wind power has compelling advantages. Primarily, kites work in tension, so they can be huge and lightweight. Traditional wind turbines contend with bending and compressive forces. Compare a modern suspension (tension) bridge with an old arch bridge (compression and bending). An arch bridge quickly becomes too heavy to build at scale. The lightweight tensile structure allows kites to scale, and therefore to work through large volumes of wind at high altitude. We all know the problem with kites. Kites are hard to control. They fall from the sky. They love getting tangled in trees or if you’re really unlucky power lines or air traffic. That’s a problem. 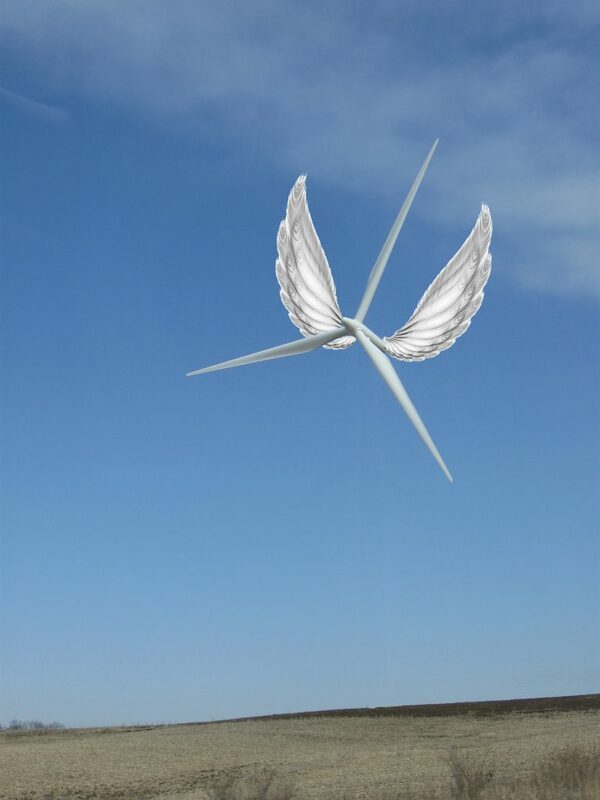 The control problems dominated early Airborne Wind Energy Systems (AWES) research. TU Delft, Freiburg, AWESCO and others conducted brilliant, primary research on kite power. Control was the essential primary focus because the designs being considered used a single kite wing on a long line. Standard kite designs were thought to be the fastest and most powerful. But they have serious drawbacks and compromises. 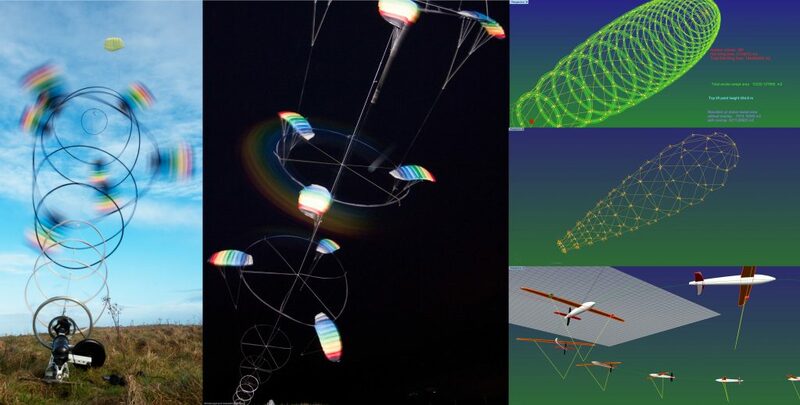 Alternative kite-tethering network designs have now demonstrated critical advantages in control, power density, reliability, safety, efficiency, scalability and more. Networked kite designs exploit wide tether mesh patterns. A kite set on a network node, is fixed in position like a fly stuck in a spider web. A network of kites holding steady through extreme turbulence. Despite hugely turbulent winds making individual kites pull hard in random directions, kites linked in a network hold position well, even without a control system. Unsurprisingly, this design was not popularly investigated for AWES. This stable network of lifting kites is the opposite of fast moving. This is where another kite network design comes in. 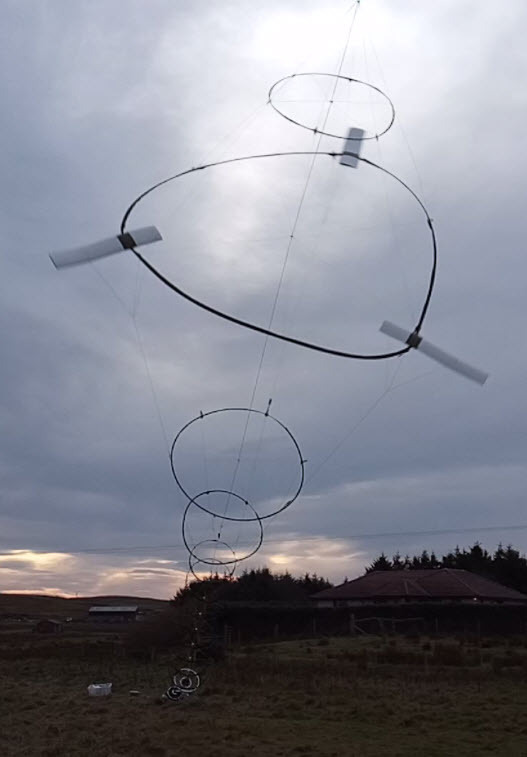 A fast spinning autogyro kite turbine network called “Daisy”. Kite power research usually exploits line pulling and retraction (yo-yo) or a kite lifting a wind turbine to send electricity down the tether (drag mode) But Daisy auto-gyro kite networks transmit continuous torque power to ground using multiple tethers around rings as a tensioned flexible shaft. This design relies on there being enough tension in separated kite lines to allow torque transmission. With more tension, more torque can be transmitted more efficiently. More kite layers on the network stack, means more tension and therefore more power available. 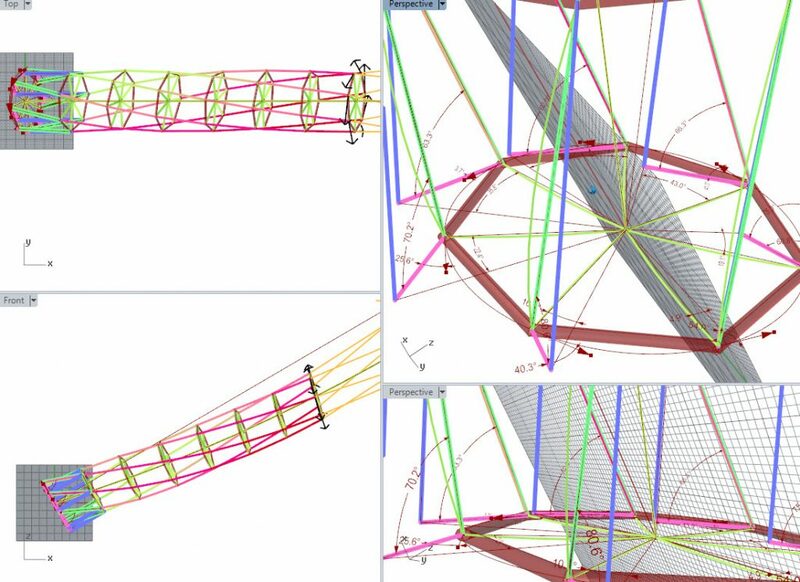 Daisy – a tilted, hollow-axis, stacked, autogyro kite-turbine network. Catchy description. Networks are amazingly resilient to damage. In the last test (see videos) a single layer, rigid kite ring, with <2kg flying material, output >1.4kW before a problem developed. There was no line tension sensor on the generator control. At high torque, high speed and low line tension, the lines over twisted and eventually broke through. Despite 7 lines breaking, because the network had a back-stop line, nothing broke away from safe anchoring. Daisy kites exploit the amazing scalability, (from speed, power to weight ratio and wing loading) of small rigid kite turbines. Soft kites were used in early tests. Rigged as a turbine, the kites spin to give continuous clean power output. The “shaft” of kites stays exactly in the “kite power zone.” To stall the shaft the kites can be pulled to the side of the kite wind window. Tensile network design allows the power of this architecture to scale. By combining the two network types. The Daisy (rotary networks) benefit from steady lift provided by the lifting kite networks. Kites are lightweight, so they are easy to transport and because the force is in line with the material, they do not need a foundation, just an anchor. 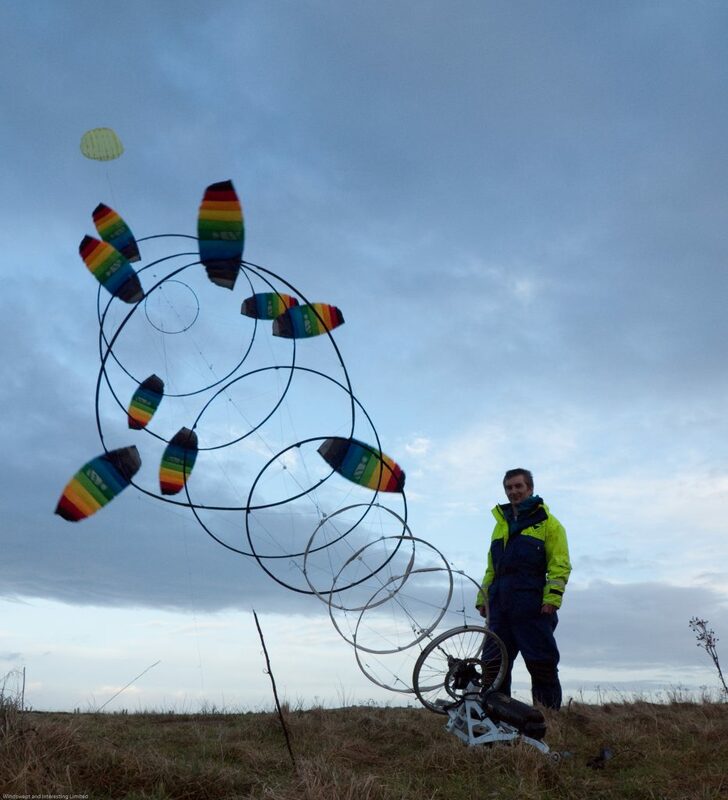 Windswept and interesting Ltd have tested transportable kite networks, which can be taken camping and be used to charge an EV car battery. With Daisy kite networks, kite layers can be added starting close to the ground and going all the way up the stack. The kite layers help to expand the “shaft stack” which keeps powerful torque transmission viable. Analysis of the design scalability by Oliver Tulloch (University of Strathclyde) and Roderick Read (Windswept and Interesting Ltd) is starting to reveal how vast volumes of wind energy can be harvested in an incredibly clean, cheap and safe way. Look forward to hearing more about kite farm networks soon.